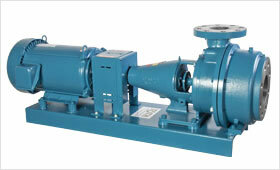 Advanced two stage pump for intermittent or continuous high pressure pumping of hot chemically treated feed water. Designed to deliver high pressure at medium to low capacities without cavitation. 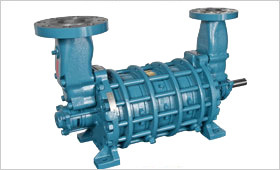 Roth high pressure boiler feed pumps provide reliable service operating at a low 1750 RPM further shielding parts from particle abrasion and wear. All Roth high pressure boiler feed pumps are two stage pumps with center mounted impellers between two bearings for balanced shaft loading. NPSHr as low as 3 ft.
SF - Standard Fitted - Cast iron case and liners, 416 stainless shaft with bronze impellers. BF - Bronze Fitted - Cast iron case, bronze liners, 416 stainless shaft and bronze impellers. BI - Stainless Trim - Cast iron case and liners, 416 stainless shaft with 416 stainless impellers. BL - NiResist Trim - Cast iron case, NiResist liners, 416 stainless shaft with 416 stainless impellers.